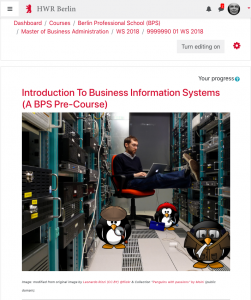 our school (on: business information systems). Over the past few years I created two MOOCs (“Massive Open Online Courses”), which are now being used by hundreds of students at our school. Not as “massive” an attendance as for many professional platforms but in principle, these courses scale, too, i.e. the number of participants is not limited. MOOCs typically mainly deliver instruction. There are different flavors, though: in so-called “cMOOCs”, connecting the participants is an important objective. But popular MOOC-hosting platforms like Coursera, edX, FutureLearn, Udacity etc. are dominated by “xMOOCs” focused on instruction: as a learner, you go there to take away information – deliver content – rather than to meet and exchange information with others. Therefore, MOOCs, much like textbooks for classroom teaching, have an updating problem. This problem is more serious for MOOCs than for books, because MOOCs are produced by large teams (10-15 designing lecturers is not rare), because the production itself is more involved than merely writing text and creating images (most MOOCs deliver content in the form of videos, quizzes, peer-review exercises etc. ), and because the content has to be well aligned along a logical pathway. A MOOC is not a book but a substitute for a true classroom experience, for a “real course”. In such a real course I update content and form, working both as a lecturer and as a “performer” endlessly and continously. I have described the problem, now let me talk about my solution. It’s called “Slack”. Slack is a so-called “Instant Messenger App” like WhatsApp or Instagram. Unlike these two, it is optimized for professional applications. In many companies, Slack is replacing e-mail as the main medium of intra-office communication. I have described in two other, extensive articles how exactly I use Slack in my classes (see below). 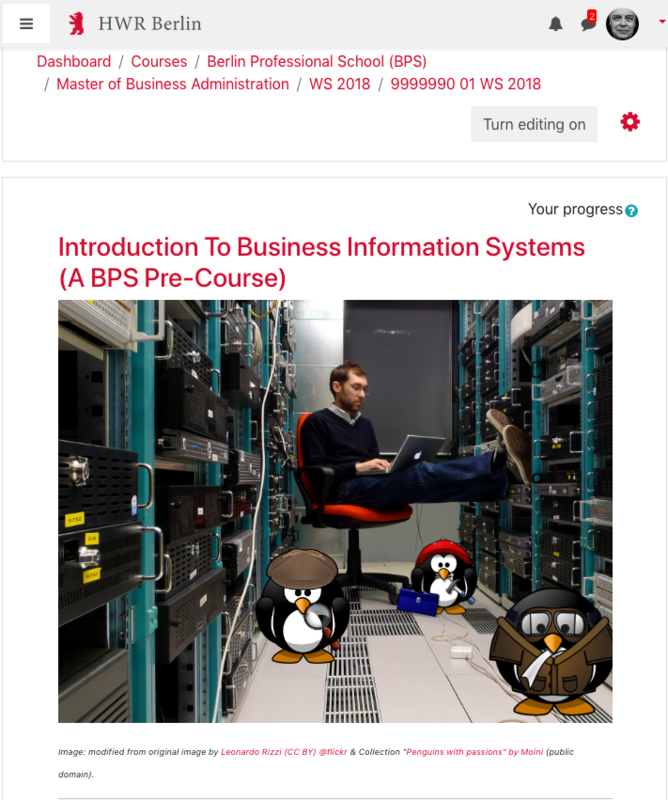 I use it in all my courses not just for MOOC-based teaching, but in connection with MOOCs, the app serves mainly to help me update my MOOCs. It is quite simple, really: I mostly share resources that I come across. Of course only after using, inspecting and validating them so that I can post them alongside a short comment. Most of these resources turn out to be articles on topics relevant to the course. Current example: I shared an article from the “New Yorker”, with the attention-grabbing title “Why Doctors Hate Computers”. In one MBA course who currently uses the MOOC, there were several doctors. In response, one of them posted a detailed description how hospital doctors actually deal with digitization today (in short: doctors don’t hate computers, quite the opposite, but some information systems are quite frustrating to use). 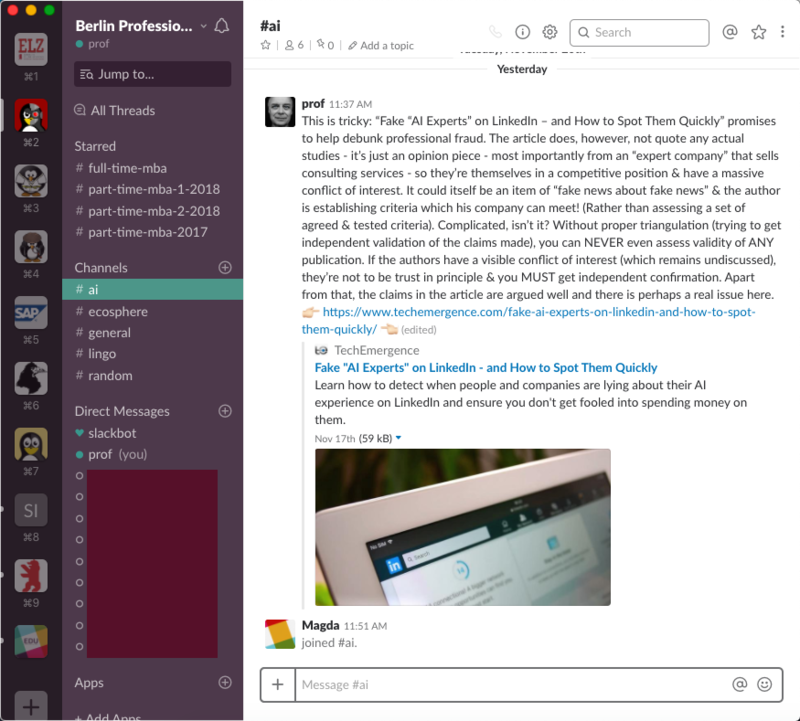 Image: Slack space with channels (left) and a longer comment with link by me (right). I put each course in one Slack workspace with different public or private channels. The (public or private) channels are aligned with the different course topics. In this way, I can post resources on a topic to any student who is interested in it (and who has joined the channel). None of this is world-changing, but it is significantly better than e-mail or forum news threads. The spectrum of resources includes videos, texts and Gifs (to entertain or grab attention), and news about the course itself. It is interesting to see how much course participants are using Slack. Example: in the Slack space for a new MOOC (an online pre-course on IT) I with 40 participants, I had personally posted 50 times in the first month – a little more than one post per day. In that same period, almost 500 messages were exchanged – most of them as direct messages. Hence, participants of this instruction-centered online course really meet up and exchange information in the Slack space. The problem of updating the finished, conserved MOOC is not fully solved by using Slack, because engaging with Slack is optional (for data privacy reasons) – only 50% of the MOOC participants also participate in Slack – and the MOOC itself still has to be actually altered and updated at some point. But at least I now have a possibility to expand and update – most importantly in direct contact with the course participants. Slack is only the tip of the iceberg. One can view this deployment of multiple tools as a new “business model” for teaching, as a kind of bundling known in digital economies. Other aspects of such an educational bundle could be: degrees and certificates, career information, coaching, networks etc. – all those things that are considered relevant to a good education but that, at present, have to be sought and found individually with much effort. Brücken über den digitalen Abgrund? – Wie man mit Messenger-Apps Kommunikation und Kollaboration in Kursen verbessern kann (aber nicht muss). Playpals On A Digital Fault Line Or Participants Missing In Action? – How The Use Of Instant Messenger Apps Changed The Dynamics In My Classroom. The original version of this post appeared in German on the elearning blog of the Berlin School of Economics and Law on 28th November 2018.